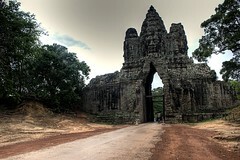 The Apsara Authority has decided to postpone implementation of a ban on buses containing more than 12 seats within Angkor Thom, and an official said yesterday that the body hoped to discuss the issue at length with the Tourist Transport Association. Earlier this month, Chrun Sophal, the bodyâ€™s communications director, said the ban would go into effect on August 1. He said yesterday that the deadline had been delayed, though he could not provide a new date. â€œWe will implement it in the future,â€ he said.